Leo Paper Group (Hong Kong) Limited (the “Group”), a leading global printing communications company based in Hong Kong, has announced that its wholly-owned subsidiary, Leo Paper Group Finance Limited (“Leo”), has signed a HKD350 Million Four-Year Green Loan Term and Revolving Credit Facility (“Green Loan”) with a group of seven leading banks. The loan is to be used in accordance with the Group’s 2018 Green Loan Framework which has earned the Green Finance of Pre-Issuance Stage Certificate issued by the Hong Kong Quality Assurance Agency (“HKQAA”) on 13 August 2018. Leo is the first privately-held company in Hong Kong to obtain this Green Finance Certificate and complete a Green Loan. The signing ceremony of the Group and the 7 institutions participating in the Green Loan take place on 3 September 2018, demonstrate the Group’s commitment in deepening its environmental constructions, the participating banks are: The Bank of East Asia, Ltd.,BNP Paribas, Citibank, N.A.,Hang Seng Bank Ltd., The Hongkong and Shanghai Banking Corporation Ltd. , Mizuho Bank, Ltd. and MUFG Bank, Ltd. The signing ceremony of the Group and the 7 institutions participating in the Green Loan take place on 3 September 2018. Leo is the first privately-held company in Hong Kong to obtain this Green Finance Certificate and complete a Green Loan. 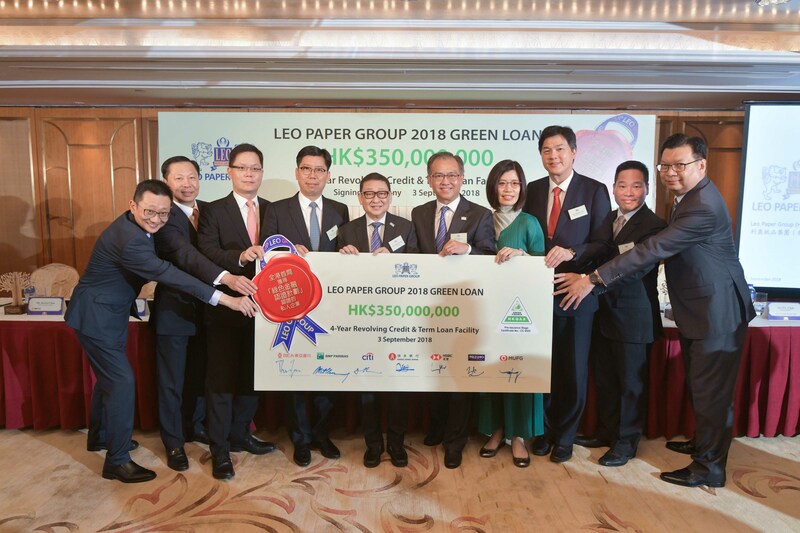 Group Chairman Mr. Samuel Leung announced Leo is the first Hong Kong privately-held company and the first manufacturer to receive the HKQAA Green Finance Certificate. Mr. King Lai, the Group CFO, appreciated the effort from all professional parties involved. Proceeds of the Green Loan are to be used to finance 20 green projects of the Group in China in coming few years. These include investments in plants and facilities used by the printing industry that aim at raising energy efficiency and reducing carbon emissions and waste, as well as projects that promote green construction. The Group’s 2018 Green Loan Framework is now available on the HKQAA website for download. ©2006 The Hong Kong Printers Association. All Rights Reserved.